Saving Sumatra's Wild Orangutans Some scientists believe the orangutan — a Malay word that translates to "man of the forest" — may soon become extinct, wiped out by the humans it so closely resembles. 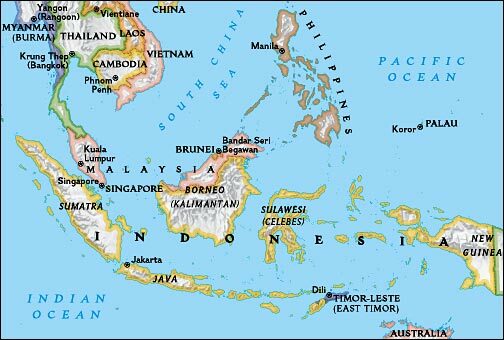 We travel to the Indonesian island of Sumatra to profile competing plans to save the great ape. 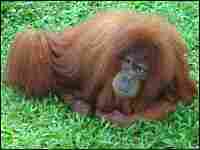 An orangutan relaxes at a preserve in Bukit Lawang. 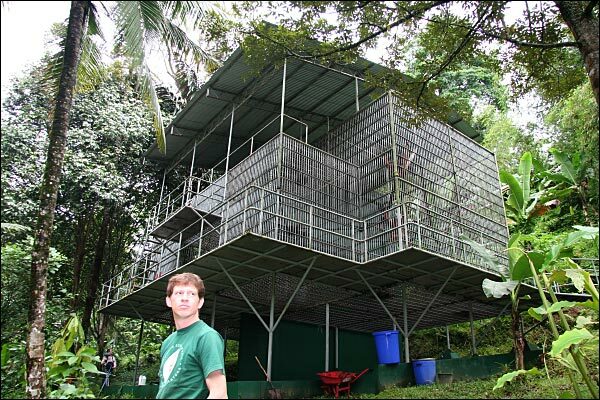 Ian Singleton, scientific director at the Orangutan Conservation Program, stands in front of a quarantine cage. After the animals are given physicals and vaccinated, they will be returned to the wild. 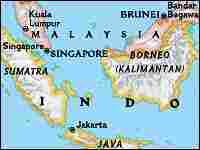 Sumatra is just one of many islands that make up the Indonesian archipelago, stretching from New Guinea to Andaman Sea. 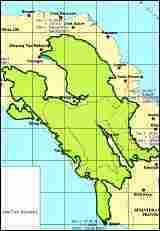 Wild orangutans are found in just two places on the globe: the Indonesian island of Sumatra in Southeast Asia, and on the neighboring island of Borneo. 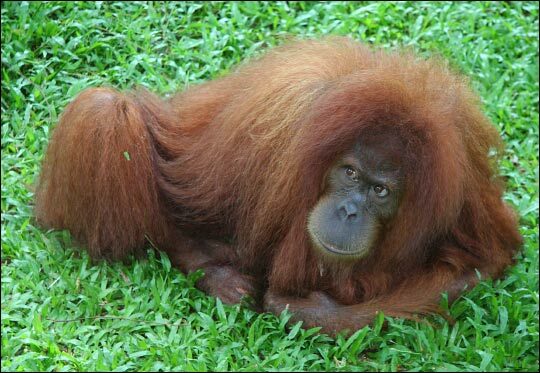 Some scientists believe the orangutan — a Malay word that translates to "man of the forest" — may soon become extinct, wiped out by the humans it so closely resembles. Public attitudes about orangutans may be leading to the loss of habitat. Most people in the region see orangutans as pests, or pets — something to be controlled or gotten rid of, but not protected. Lowland forests are being cleared at an alarming rate, the trees sold for timber and the land replanted with rice or corn to help feed Indonesia's fast-growing population. But trees are key to orangutan survival — they eat, sleep, mate and travel along the high branches, rarely setting foot on the ground. In zoos, orangutans have a reputation as the strongest and most destructive of the great apes. In the wild, their movements are languid, almost casual, hands and feet used interchangeably as they move from tree to tree looking for the best fruit. While developing nations have embraced ecotourism as one way to attract tourist dollars and preserve endangered species, similar efforts to create tourist-oriented orangutan habitats in Indonesia have been less successful. 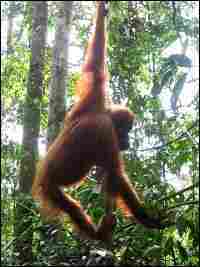 When orangutans live close to humans, they tend to become dependent on the food the tourists give them. They become bold and aggressive. 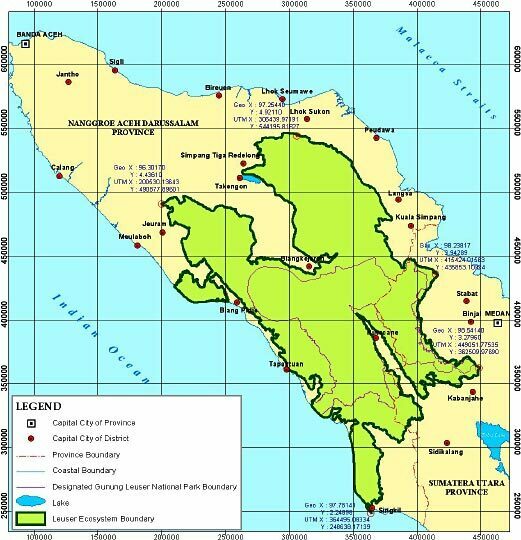 But without the tourist dollars and attention, illegal logging could start up again. One group is trying another tactic: reintroducing orangutans to protected forests to the south, where they were hunted to extinction about 150 years ago. Ian Singleton, director of the Sumatran Orangutan Conservation Program, says roughly 500 orangutans are needed to create a genetically viable population in the south. About 60 have been released so far. 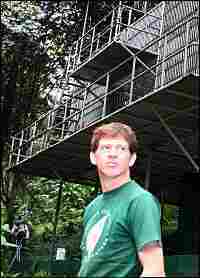 These colonizing apes are castoffs, misfits, orphans and zoo animals, and after a period of quarantine, are released into the wild. "What we're trying to do is slow down the decline, so that when Indonesia does eventually start to take more concern over it's wildlife, there will be enough to salvage," he says.